Lynn here, from Riggstown Road, and nothing motivates me more than sunshine. Whether I’m doing house work, yard work, or school work, it just makes everything a little happier, ya know? My daughter, Elizabeth, chose to do this project and she painted the brightest, happiest sunshine I’ve ever seen, using her choice of colors and style, and I LOVE how it turned out. (In her words, it had to be perfectly imperfect. Wonder where she gets ideas like that?) I took the simple little painting and added some simple little words to it and created this printable art. I love how it’s something we did together. And I love that it’s sunshine. Didn’t I mention that I am partial to sunshine? 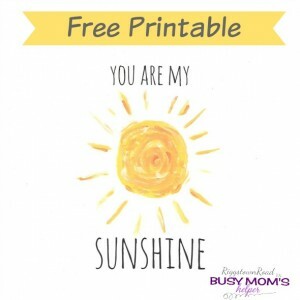 And, just like the real thing, I love how this printable version can brighten your day by brightening your space. Add it to your spring vignettes, or hang it on your own little “sunshine’s” wall. You’re sure to smile every time you look at it…at least I do. 🙂 I like the white space, but if you trim it off, the graphic is designed to fit nicely into a 5×7 frame. Perfect for someone’s desktop! I’m so excited to be guest posting over at Tatertots & Jello today, sharing how I made some Colorful & Fun Wall Decor in an Afternoon using products from Jen’s new line! Be sure to head over and check out how all of this was done in hardly any time at all! I don’t have a ton of time to spend creating fun decor for my home – do you? If so, please share your trick on finding the time! Until I can find some magical ‘time in a bottle’ trick, I’ve got to make do with some quick and simple crafts like these! 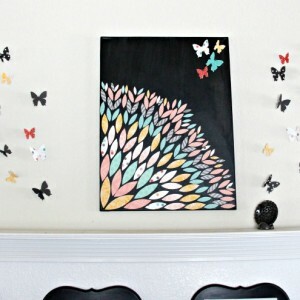 Here’s some more fabulous & easy home decor for you to check out, too! You can switch the colors, style & more to make the Spoon Wreath your own! Add a personal touch to wall decor OR tables with a Family Next Framed Art!